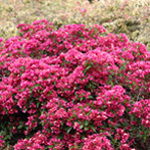 “This is a selected seedling and been trialled over 10 years. 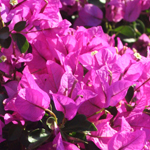 It has horizontal branching rather than erect, grows about 600mm tall and 2 metres wide. 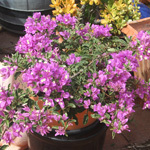 Ideal for ground cover, it is tolerant of rainy weather in as much, it does not defoliate. The bright purple flowers (bracts) are stunning. There several others to follow in the babybino series and they are set to be winners in every garden."